September 2010 - Get Ready to Ride with the River Hawks!Get Ready to Ride with the River Hawks! So I went over to the lovely Career Services and made an appointment!! If you wanna know what you can do with your major you can click here! Don’t be shy! These professionals can help you out! The earlier you go, the better it is for you. The flu season is upon us!! Here are some steps to make sure you keep yourself healthy!! – Wash Your Hands, it’s the number one way to keep yourself healthy! – Don’t Cover Your Sneezes and Coughs With Your Hands, use a tissue! – Don’t Touch Your Face, you’ll pack on the germs way faster if you do! – Drink Plenty of Fluids, flush your system daily! – Take a Sauna, proven to help preventing cold and flu! – Do Aerobic Exercise Regularly, keep that ticker healthy. – Eat Foods Containing Phytochemicals, eat dark green and red fruits and veggies!! – Eat Yogurt, research shows that eating yogurt and cut your chances by 25%! – Cut Alcohol Consumption, it suppresses the immune system!! – Relax, you NEED your rest!!! For those of you who have been here before…it’s that time again! And for those of you who haven’t, you probably have no idea what I’m talking about. Well, since I’m so nice, I’ll tell you. A PERFORMANCE BY UML’S STEP TEAM: STEPPIN’ IN UNITY!!! AN APPEARANCE BY THE UML CHEERLEADERS!!! To gain entrance into the competition as a spectator, all you have to do is bring one canned good. And if you don’t have that, you can just pay one dollar at the door. If you want to enter a team, it will be $15 but if you’re by yourself then it will be just $5. There will be prizes for first, second, and third place. And once again…GIVEAWAYS!!! This will all be happening at the Campus Recreational Center from the times of 7-10. If you want to play, come on by. If you just want to watch…still come on by! We hope to see you there. You might just catch a glimpse of some of your favourite Orientation Ambassadors and Leaders! The best way to get involved would be getting a group of friends together and making a team… Its a fun way to play sports but not at the varsity level. Don’t have enough players not a problem there are people who sign up as a free agent, and can go to any team. Last year I tried something totally different, broom ball. What is broom ball? Think about hockey, subtract, some pads, skates, and gloves. What are you left with, sticks a helmet, a ball and a bunch of people. Thus Broom ball…..Try it!!!!!!! Sign up for the 2nd half of intramural’s is starting SOOOOOOOOOOOONNNNNNNNNNNNNNNNNNN!!!! Like Movies?! Wondering what to do during your free time?! 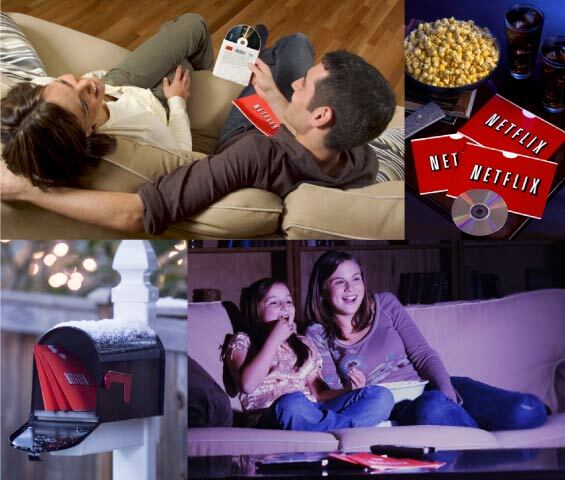 You have probably heard of a movie service called Netflix right!? Well let me inform your that this is a college student’s best friend! Well for only $8.99 a month you can receive Unlimited DVDs (one at a time of course) straight to your mailbox in your res hall! This is such a convenient way to get movies without having to leave campus. And another great thing is the Watch Instantly feature on the website. This allows you to watch tons of moves right from your COMPUTER! There are also great TV series on there as well!! So if you have that extra cash a month, why not go for great movies. Invite friends to your rooms and have an awesome movie night! Well, I’ve been really stressed out with school work! Everything seems to be piling up..and up…and up..and up! Not too mention the enormous pile of laundry I had to do last night. So, I have been getting a ton of advice from others to DE-STRESS this week! Almost everyone I’ve talked to has told me this. In through the nose, out from the mouth. 2. Take it slow, one at a time. I’ve been trying to do too much at once, but after I broke all of my work down into steps and what needs to get done first. The load was much easier to bare. 4. Don’t put it off. If you have free time between classes or earlier in the day, try and get your stuff done then so you can relax at night!! You’ll have a better night’s sleep and be ready for what tomorrow brings! Make sure you’re balancing your schedule and you have some time for YOURSELF. It’s TOTALLY IMPORTANT to be able to relax, blow off steam, goof around, and playyyy. You’ll be a lot less like me this week if you follow these 5 easy steps!!! And if you can’t pull yourself out of this stress, or just need someone to talk to about everything…I’ve got an idea. Head over to the Counseling Center. It’s FREE and you can make an appointment to talk to someone outside of your personal life. It’s such a relief to talk to an outside party about what’s really going on. You can talk about classes, friends, roommates, home, relationships…ANYTHING!!! It’s an AMAZING resource that is available to ALL students. So take is easy this weekend and do something for YOU!!!! Feeling Stressed Out Lately? Me Too! is pausing from all your busy work to reflect on all of the stuff that is stressing you out and will continue to stress you out. If you want to relax then sit down and watch a movie and don’t think about anything. You could join an intramural team and use that to distract you from your daily worries. Or you could go for a run or workout at the Rec Center. There is so much around campus to keep you distracted from all of these stressful things, so make sure you are utilizing them! Last year my grades improved after I joined the Rugby team because I could think more clearly when I wasn’t going over everything I have to do. So again, make sure you are taking time for yourself, because you NEED your sanity to graduate school, I promise! I hope everyone’s stress levels are low and you’re enthusiasm to get out of your rooms and do something/meet new people is high! Have a great semester! Tomorrow is the first day of Fall which is by far my favorite season. Let’s be honest, the weather is much nicer, the foliage is gorgeous, and there is so much to do! I am here to inform you of such things to do whether it be in Lowell or the surrounding cities and states. Apple Picking and apple pie making! Apple picking is my absolute favorite thing to do in the fall. I can very easily eat 3 apples in the process of apple picking. Luckily there are a bunch of apple orchards in the area so you can go out with a bunch of friends and make a day out of it! Pumpkin related items! Pumpkins go hand in hand with apples. Most of the time you can find pumpkins at apple orchards or even grocery stores. Another awesome thing is that you can find a lot of pumpkin carving stencils online for free or little money. Remember to keep the seeds so you can roast them! Close by orchards include Mack’s Apples in Londonderry, NH, Parlee Farms in Tyngsboro, MA, and Mann Orchards in Methuen, MA. Salem Witches! Okay, I lied when I said that apple picking was my favorite thing to do in the fall, the Salem witches are by far my favorite. Grab a couple friends some Sunday and head down to Salem, MA. My favorite attractions? The witch museum, the pirate museum, and the House of the Seven Gables. Other favorite? Ruth’s Italian ice in the mall! They have Swedish Fish Italian ice, it is amazing! Click here! for more information of all the events in Salem. Trick or Treating / Costumes! The university offers “Safe Zone Trick or Treating” in Sheehy and Concordia. You can stand outside your room and hand out candy or participate in the haunted house in the Concordia basement. Keep your eyes peeled on all the school bulletin boards for more information. Foliage! Pack a picnic and take a ride up to New Hampshire or anywhere through Massachusetts and take a good look at the changing colors of leaves. Pretty soon those leaves will be gone and we’ll be waiting for snow (hopefully not too soon)! Beginning Hockey Games! The first hockey game of the season is October 3 at 3 p.m. versus New Brunswick at the Tsongas Center! It’ll be a good time for all! Check out our athletic site for the complete hockey schedule here! I hope this inspires a lot of you to get out there and do something (when you aren’t busy with homework)! Tell us if you’ve gone to any of these places or plan on it! Hello everyone! I hope you are enjoying this fantastically beautiful Tuesday…day! It has been the first few weeks of school and this blog is for all of you who are living on campus and have a room mate… or 2… or 3! I’m sure that some of you by now are ready to rip out your hair because your room mate(s) are driving you up a wall and you want to get as far away from them as possible. Just take a few steps back a a few deep breaths and TALK to your room mate. Communication is a big part of any kind of friendship or rather in this case: ROOMMATESHIP. (Brand new word for all of you, feel free to use it in everyday conversation). Get to know you’re room mate in case you haven’t already.. You might find that you have a lot more in common than you thought and best yet, if you talk it out, your room mate will be more aware of what they are doing to drive you absolutely insane (and bald), and will stop doing the annoying act that is making Rogaine’s stock go through the roof! Also, if you already have tried this, talk to you RA about the situation. They are there for you and to make sure that you are having a great time while living on this campus. They can help you if you have any problems with your room mate and your ROOMMATESHIP (seriously, use this in conversation if you want!) that cannot be solved by simple communication. Might I suggest that you all get lunch with your room mate sometime, or just hang out with them, maybe tell them about your day, and your lack of hair. You will be living with these people for at least a semester, so you should be friends with them and hopefully you will have just made a great life-long friend!